and there's a lot of quilting to go before Little Elephant is done. I thought I was getting on well, but having just laid it out and had a good look I have to admit to myself that I'm barely halfway through. I thought this might be a good time to reflect on the wadding I am using (Sew Simple EcoBlend - a 70/30 cotton/polyester mix, using entirely recycled materials). I picked it because it was a recycled material, which really appeals to me and so far have been quite happy with it. It's quite flat, compared to the wool I was using before, but has a pleasant, slightly felty feel to it. Here's a close-up. Luckily it turns out that these are happening mostly around the edges and I'm sure they are just drifting off the wadding where it is not quite covered at the moment. There has been absolutely no problem in the areas that are now quilted. Phew. The quilted areas have a nice drape and sitting under it to work is warm and cosy, so all things considered I will definitely use again. Meanwhile, back with the denim, I have sewed a couple of bigger bits together this week, using some smaller, already stitched bits and some as yet unstitched, which I am now working into. Next I think I'm going to join these together. As usual I'm linking up today with Kathy's Quilts for Slow Sunday Stitching. sorry to say the poly is what is migrating. It will continue. That's why I changed to mostly cotton myself. Don't pull it as it never really stops holding hands with it's mates and makes a long tuft that breaks of then you pull that bit and and and. I have been using hobbs 80cotton 20 poly to give it some loft. It doesn't seem to beard. 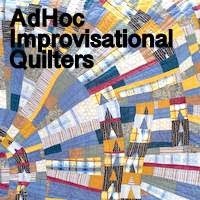 Oh it occurred to me you're hand quilting. Silk or wool is easiest. Poly is easy but beards. What's the answer?? Have you tried bamboo? It shrinks a lot tho. So funny our discussions of batt. My grandmother put in old quilts, raw cotton, or old wool blankets and hand quilted all of it! That was a woman who made do. It was interesting to hear about a new batting. I still haven't tried wool yet, and that is on my "to do" list. What a beautiful quilt, little Elephant. But I didn't see the elephant there. And then I love to study your denim stitching. Interesting batt. I usually use a very thin cotton batt like Mountain Mist Blue Ribbon because I live in such a warm climate. But like you, recycling is appealing. It's always good to see the Little Elephant! Ah, darling Little Elephant! It's great to get an update: it's coming along beautifully. Barely halfway also means that you've finished half! Can't expect it to go quickly unless you put it on the machine, right? I'm teasing. I'm usually the one who wants to sew quickly, remember? You're the one who likes to sew slowly! That recycled batt is interesting. I use cotton because I buy it cheaper by the bolt (roll) for the long-arm and I'm allergic to wool. Have a great week of quilting!